Please note: Current stock of this item has a slightly longer blade than is typical for this sword. The blade may not fit perfectly within with scabbard, slightly extending out the bottom of the scabbard, about 1/4 in. to 1 in. Finally! The perfect sword for the edged enthusiast at an unbeatable price. The 27 in. stainless steel blade is heat tempered. The handle is constructed from hardwood and wrapped with black cording with brass tips. Included is a blade scabbard wrapped in black cording, complete with shoulder strap for easy carry! Low price makes this sword a great choice! The ultimate ninja collectible! This is good as a beginners sword, I haven't had any previous swords except for ones ive made myself., anyways the imperfections in the sword. at the base of the handle there used to be a few threads, i dont know what they are called but they came out quite easily. the guard has a few sharp points but not much, the handle was covered in a loose cloth wrap which slides down after repetitive use, but with a small tough push it will spread back. now onto the sheath strap the little metal clasps break easily and the cloth rips around the metal clamp quite easily. now onto the blade, it came extremely dull the word pakistan was engraved in the bottom of the blade it is very annoying ill file it out later it was bent to the left, it was also bent slightly forward. for the price this was a good blade but if the price was increased i would not buy it i plan on buying more swords later,i rated this 3.6 but ill round it to 4.
the sword was cool at first but it came bent and extremely dull. the wrapping on the handle and sheath came off fast. i don't recommend you buy this if it is your first sword. 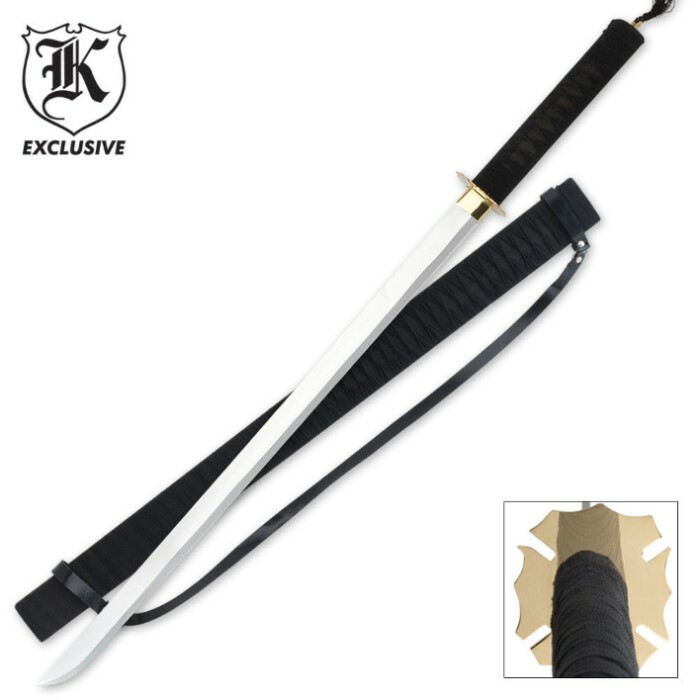 I ordered this sword with the highest hopes but was disappointed when it came. The product description said sword with sheath But only the sword came. When I called the company to switch it out with one that had the sheath they refunded my money. I will try again to order from BudK catalog and hopefully my hopes wont be shattered. This sword was worth the purchase...you get what you paid for. sharp, sleek and concealable. great for ninja activities on or off the movie set! Its worth at least the purchase price if you need a wall hanger or a starter sword. Can't be sharpened.